Before the invention of modern food preservation equipment and techniques, premodern man stumbled upon the art of preserving harvested food to preserve life. Mother Nature has always thrown the unexpected at us – drought, floods, swarming insects – which could wipe out next year’s food supply. Survival was never guaranteed. But we are a creative, wily species. Thanks to our fat-fed brains and trial and error, humans learned how to preserve excess meat for lean times! Depending on your location and availability, any lean meat can be jerked. This isn’t an exhaustive list, but the following meats have been used as a light-weight, portable, nutrient dense staple for thousands of years. Wooly Mammoth – Sorry, Wooly is no longer available. Suitable wild substitutes include: venison, elk, moose, bear, caribou, fish, bison, alligator, crocodile, wild boar, and other critters. Llama – a favorite on-the-go snack of Incas. South Americans still find llama jerky tasty. On the exotic side – Yak, ostrich – and it’s cousin – emu, whale, shark, kangaroo, camel, and even horse. Equine jerky is not culturally accepted in America expect for dog treats. Mainstream jerky – Beef, sheep, pork, and turkey are popular for moderns in prepackage containers. And wait for it… Zombie Jerky! I kid you not! Nothing else helps you survive the Zombie Apocalypse like green dead meat chunks. Wow! More than you probably wanted to know. Drying is the oldest technique of preserving meat. Removing moisture from meat prevents micro-nasties from growing and decreases the spoilage rate. It was so easy cavemen could did it! Grok, after learning to corralling fire, figured out that fire would heat mammoth meat just enough to evaporate excess moisture. Super! Portable calories meant he could extend his hunting and gathering territory. Yes, drying meat over an open fire is doable. Smoking/drying meat over an open fire method is one of my Doing the Stuff skills for 2014. But for now, before the industrial machine grinds to a halt, I’ll use our Excalibur dehydrator. You can use your oven if you don’t have a dehydrator. Prop the door open with a pot holder or wooden spoon and use your oven racks to hang the meat strips. Test the empty oven temp with a cooking thermometer for an hour to see if the temp stays in the 145°-155°F range. Ovens use more energy than dehydrators and don’t employ a fan to circulate air during the process. I’ve even survived eaten jerky from Daddy’s DiY box fan dehydrator. Now you see where I get my tinkering skills! Keep in mind, the USDA does not approve of DiY box fan or solar dehydrators. Fed Gov doesn’t approve of my eating lifestyle made up of 50% healthy fats either. Oh well… as always, do your due diligence before listening to me or anyone else. An important note about jerking wild animal meat. Feral hogs, cougars, and bears have a tendency to host Trichinelle parasites. Salmonella and E.coli 0157:H7 have to be taken into account when making jerky too. According to research from my alma mater, the University of Georgia, there are 3 ways to kill the bad stuff in homemade jerky. 1.) (Easy) Post-heat the dehydrated jerky slices in a 275°F oven for 10 minutes. This is the method I use. Place the slices on a cookie sheet and pop in the oven. 2.) (Complicated) Pre-heat raw meat strips (un-marinated) in a hot brine/marinade mixture for about 2 minutes or until the meat reaches 160°F (165°F for poultry). You could also bake the meat until it reaches the safe temps. You’ll need a thin tipped thermometer to test the meat with this method. 3.) (Domesticated Meat Only) Pre-soak the sliced meat in vinegar for 10 minutes. The combination of heat and vinegar kills pathogens in non-game meat. Method 1 and 2 are effective in killing Trichinelle in wild game. 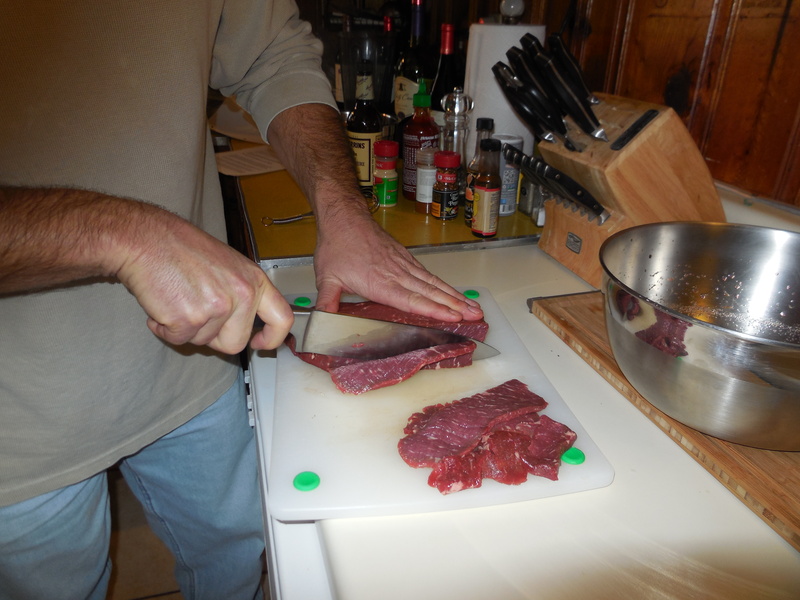 The vinegar method (#3) is not as effective for wild game. Scared yet? Don’t be. Just take safety precautions when making tasty jerky snacks. Since I’ve never tried to make ground jerky, these directions are for whole strips. Trim any visible fat or connective tissue off the meat. Cut your selected meat into 1/8 to 1/4 inch thick slices between 5 to 10 inches in length. Freeze the meat until it becomes firm (not frozen solid) to make slices more uniform. I’ve found it challenging to slice meat straight out of the refrigerator – almost like trying to nail jello to a tree – even with a razor sharp knife. Or have your local butcher run it through a meat slicing machine. Slicing along the grain of the meat produces a more chewy jerky. Cut across the grain for a tender product. Even thickness ensures consistent drying for all the meat. How you season your jerky is up to your personal preference. There are many recipes online or you can make your own – which I did. 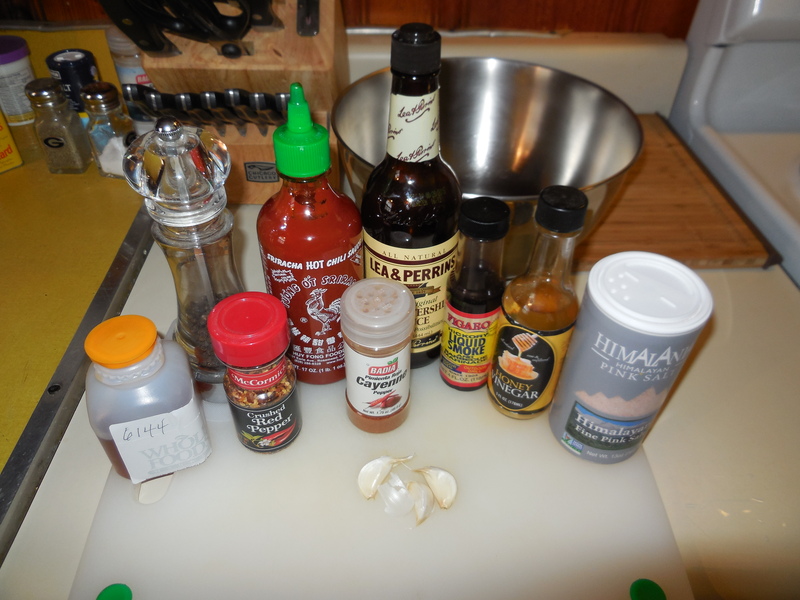 After cutting the meat into thin strips, add enough marinade to cover the meat in a food safe container . I use a gallon size zipper freezer bag. Place in the fridge for 4 hours or overnight. The longer you marinate, the stronger the flavor. You can make a simple jerky by using only salt and pepper. I like my jerky to bite back. Pre-heat your dehydrator on the max heat setting (155°F). Check the true temp with a cooking thermometer in the empty unit if you like. Lay the marinated meat flat on the trays with enough room between the pieces for air flow. Close but not touching. This batch contained more marbled fat than I like. The oil in the fat won’t evaporate like other moisture. Too much fat in the meat can cause it to go rancid. Not a problem. It didn’t last long. There are only 4 strips left in the freezer. Set a timer for 4 hours and go do some more stuff. Check the meat and temp of your dehydrator after the bell sounds. I ended up drying this batch for six hours. Again, drying times depend on your equipment and thickness of the slices. Before removing the meat from the dehydrator, pre-heat the oven to 275°F. When the oven reaches temp, transfer the dried jerky to cookie sheets arranged without touching and post-heat in the oven for 10 minutes. Remove and allow to cool completely on drying racks. 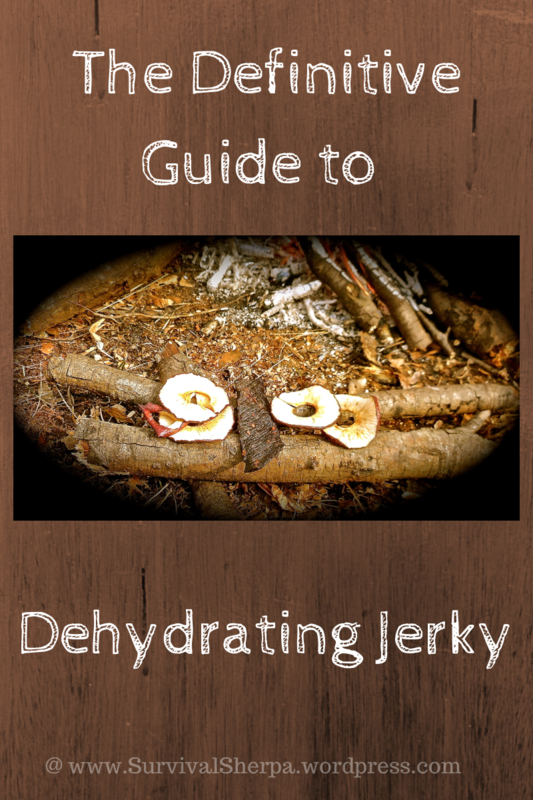 There’s a scientific way to check for dryness (aka – water activity) of jerky. But you need complicated equipment. I’m guessing you don’t have said equipment. If you did, your jerky should measure a water activity of 0.85 or less. Use the green twig method to check for dryness. Your jerky should bend and slightly crack like a green twig. The bark of the twig may break open when bent, but won’t snap in half like a dry twig. Not very scientific but you’ll see what I mean on your batch. Knowing this batch had more fat than I like, I placed them in quart sized zipper baggies after they were cooled to room temp. They were dated and stored 4 strips/bag in the freezer. One bag lasts me about a week for in between meal snacks at school. Dried fruit, nuts, and jerky ride in my bushcraft kit. Properly dried jerky will last a couple of months at room temperature – some say longer. Store it in a food safe container in a dark, dry, cool place. Mason jars are good containers. Do not pack it tightly. And no vacuum sealing – no matter how much you love your Food Saver. Store bought jerky gets away with vacuum packing by adding chemical preservatives to their product. Leave room for any residue moisture to transfer to drier areas of the jerky. If moisture collects inside the container at room temperature, your jerky is not dry enough. Refrigerated, it will last even longer. Frozen jerky lasts for a year or more. 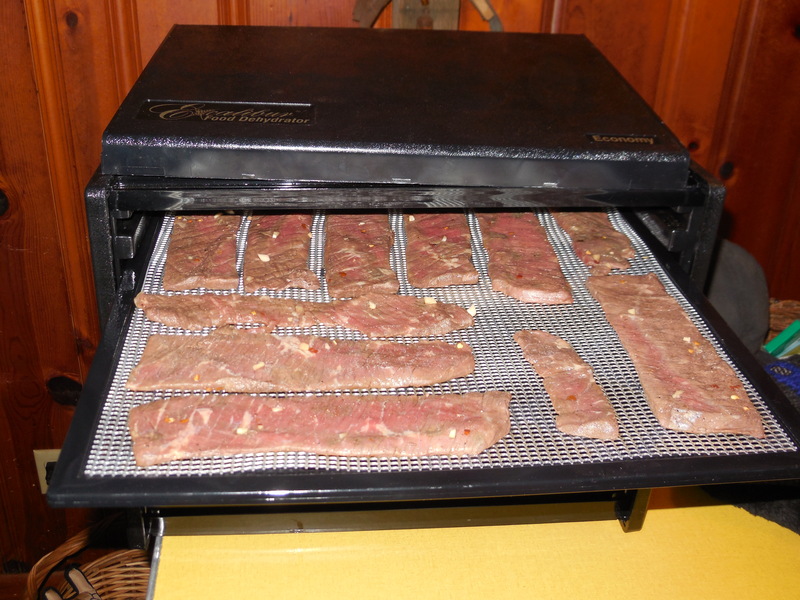 To safely salvage and preserve excess harvested meat, dehydrating is the way to go. I’ll let you know how my experiment goes with jerking meat caveman style. How hard can it be, right? Also, if you haven’t joined the Doing the Stuff Network yet, there’s still room for those of you willing to trade theory for action! This is very good. I shot a deer end of last season and wanted to make jerky out of it soon (in time for a camping trip), and what do you know, you do a post about it. I have never made jerky before so this will be very helpful. Thanks! P.S. What did you season yours with exactly?